In this month, there are many international festivals in many areas of Gunma. We hope you enjoy meeting people from different countries and experienceing diverse cultures! 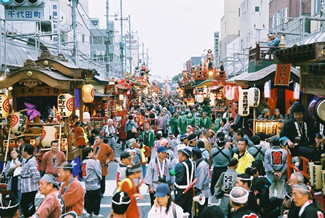 There will be food stalls from different countries, Japanese traditional entertainment, and booths to introduce different cultures from all over the world. This event is designed for the Japanese citizens of Isesaki and foreign residents to gain a better understanding of each other. GTIA will have a booth. This annual international festival provides an opportunity for you to enjoy foods and performances from different countries in an open field. Enjoy! This event not only offers international foods and performances but also provides an opportunity to experience Japanese tea ceremony and calligraphy! 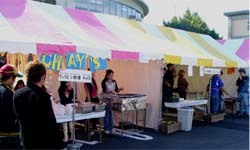 Maebashi Festival is one of the biggest events in Maebashi. The portable shrine and Gion float are proceded wtih a group of "Danbe dancers". After the traditional performance, there will be a parade of local bands' performing a variety of music. On the premise of Oiwa flower garden, there are more than 600,000 sunflowers blooming until the middle of October. This is one of the largest sunflower fields in the Kanto region. After seeing the beautiful sunflowers, you can stop by Nakanojo for hot spring and good food! 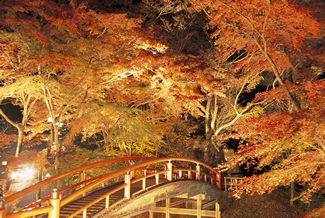 Kajikabashi is where you can enjoy an unique view of the colored leaves and the classical vermillion-colored lacquered arch bridge. Maples, saw tooth oaks, lacquer trees, and the leaves of many other trees turn to red, gold and yellow. These colored leaves and the bridge are illuminated to create a breathtaking view. I personally went to this site last year and loved it. Do not forget to bring your coat because it gets quite chilly in Ikaho around this time. For more Ikaho information, click here. Note that the illuminations may be cancelled without notice due to weather conditions. The 28th of October is Gunma Citizen's Day. Free admissions to prefectural-run facilities and other benefits will be offered to Gunma citizens not just on this day but over the period of two months from October to November. See the PDF below for the list of events/services for Gunma Citizen's Day.